Monday – Scouts for Michael. Daniel skipped GAA. Felt very rebellious. This is the last week of training of the year, we’re exhausted. Due to unforeseen circumstances (the ice cream machine broke) we are running late hoping to hit the den for 10.20. They were eventually disgorged from the scouting jeeps at nearly 11 full of excitement and chatter. As the Princess and I cycled home in the twilight (welcome to Ireland in summer) she told me all about it and the wonderful time they had and she was completely delighted with herself and her enthusiasm was infectious and we arrived home full of good humour and bonhomie even though it was very late and a school night. Wednesday – Mr. Waffle had to work late. That evening Daniel and Micheal had to pack their bags for their school tour (complete change of clothes, hat, suncream, rain gear etc. – when I checked their bags later I found that they had both packed winter woolly hats rather than summer hats which I presume was what was intended). Herself announced that she planned to rollerblade to school on Friday, her current rollerblades were too small and she had sourced a pair online which I had to reserve for her to collect on the morrow. The boys informed me that the following day was the last day for the school book rental form and money to be returned. Much consternation. 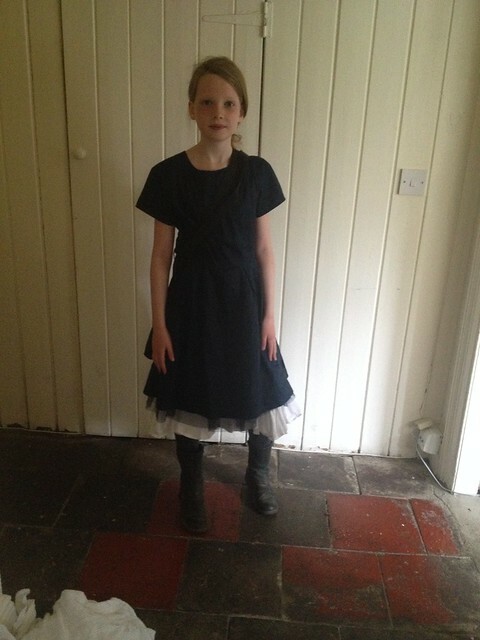 The Princess then said that she had to go to school the following day dressed as Annie Moore. She looked pretty good considering we started preparing at 6.45 the evening before. She was finally able to get some use from her massive coin collection. She brought in a number of coins from the 1880s and her classmates were suitably impressed. Thursday – The boys had a fantastic school tour. The Princess picked up her roller blades and then proceeded to bake like there was no tomorrow. 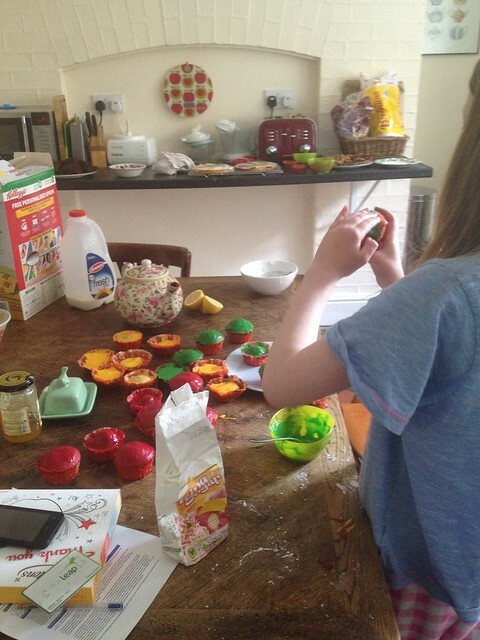 She made brownies, flapjacks, lemon drizzle cake and fairy cakes. We discovered that the clutch in the car had gone. Friday – This was the scene which met my startled gaze when I came down for breakfast at eight. She decided not to roller blade to school in the end. We had a ceremony at the school at lunchtime and sixth class got to say goodbye. I am, obviously, partial but I thought she did a great job in presenting her part of the show. The school is in an old Georgian building and the drawing room, where we had the event, was clearly not built with acoustics in mind and it was very difficult to hear most of the speakers. 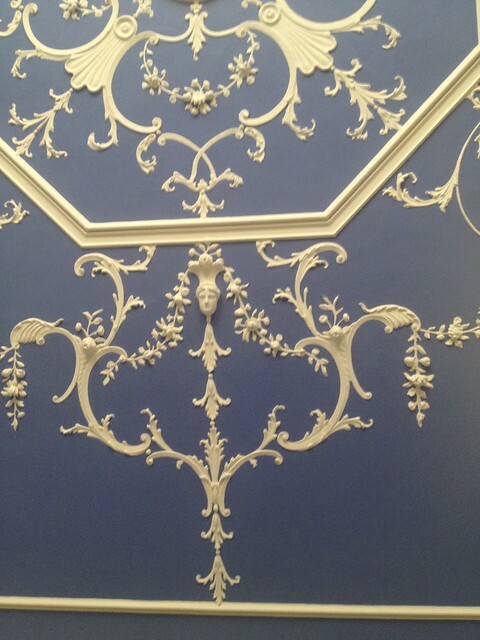 Obligatory photo of ceiling stucco. She had a really great time in primary school and made friends and was happy. She liked schoolwork and was good at it. I hope, that when she starts secondary school in the autumn, it all works out for her. I know that she will really miss primary school, and I think I saw her wiping away a furtive tear in the course of the ceremony. 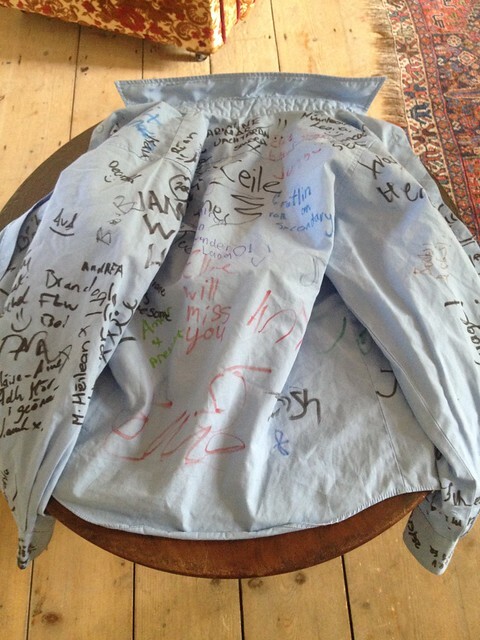 I wish the shirt had been cleaner to start with as I realise that I will never be able to wash it again. And she and her class went off to the cinema. I was going to meet her afterwards but when I rang her, she had already hopped on the bus home by herself, she hoped I didn’t mind. 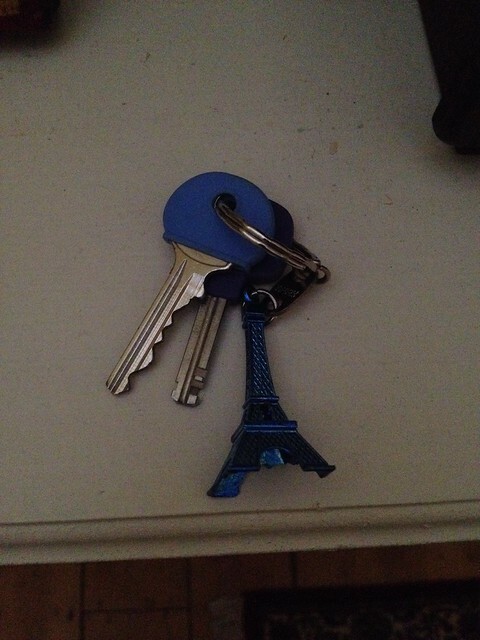 I didn’t but when I got home I also gave her her first set of house keys. Big girl. Today – Mr. Waffle got up at 6 to go to Cork for a funeral (non-Irish readers, no one particularly close to him, mother of a friend, Irish people specialise in funeral attendance) and will be back mid-afternoon to grace the street party with his presence in his role as chairman of the residents’ committee. It was beautiful this morning but, inevitably, it is clouding over now. We need to do more baking for the street party. Sigh. Meanwhile in the absence of a car, a kind neighbour picked Dan up for a GAA match in Malahide at 8.45. This is his last outing until September. Rejoice. Also, this week, because it was quiet (hah), we got a couple of the windows repaired. 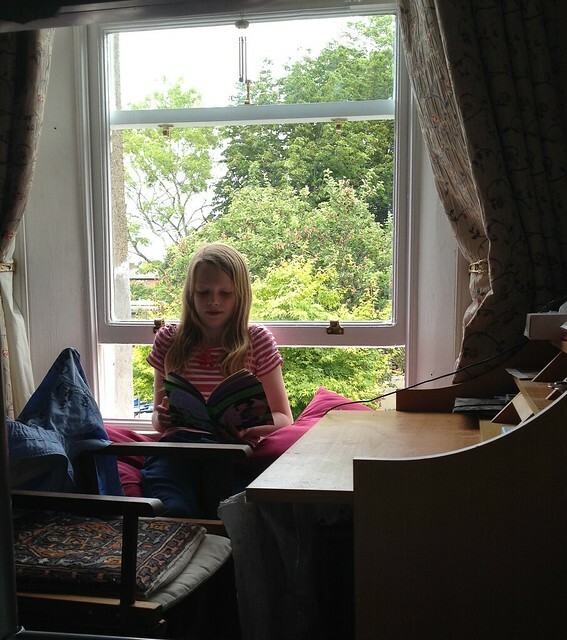 Here is the girl of the moment sitting in front of her new window in an utterly unposed (ahem) image. She is genuinely pleased to be able to open her window and also that the crack across the top, through which the winter wind used to whistle, has been repaired. And how was your own week?